IN HEART OF PARK CITY! 2 BLKS TO PCMR BASE LIFTS! ON FREE BUS LINE! Stay near all the action! Only 2 blocks from main Park City ski lifts, and a just a short 1/2 mile walk to Historic Main Street. No car needed. Free shuttle runs right in front of condo. Warm fires, soft beds, and a relaxing 12-person jacuzzi (open during ski season only) will make your stay so enjoyable. Ideally located just 2 blocks from the Park City resort center. Only 1/2 mile to Main Street dining, shopping, and nightlife, easily accessible by Free Shuttle which stops 1/2 block from the condo in either direction and serves the entire Park City/Deer Valley/Canyons areas. Private parking, coin-operated laundry facilities, cable TV, wireless internet. Beautifully decorated, extremely clean, and very well maintained. Of course, Park City is famous for the skiing, but while you’re here, you can also take a lap around an ice skating rink, go on a sleigh ride, or view the sunrise from a hot air balloon! Plenty of activities to fulfill every individual's desire, outdoors as well as indoors. Take a walk down one of Park City's streets and immerse yourself in the historical ambiance, and then lose yourself in the culture. Gallery stroll. Local theater. Shopping. And don't forget the world-class dining! Once the snow melts, watch the mountains turn into a summer playground bustling with activities, from hiking, biking, and horseback riding, to golf, tennis, fishing, whitewater rafting, and boating. Come enjoy a summer full of mountain fun and fresh air! With Park City's calendar constantly packed with music events, art exhibits, dance performances, and more, there is never a lack of activity on or off the mountain. Enjoy the Park City Wine Festival, Arts Festival, or the Deer Valley summer jazz concerts. Add plenty of shopping, dining, and nightlife to the mix, and there’s no excuse not to visit Park City, no matter the time of the year! Full rental amount (including tax) is due at time of booking. Reservations must be paid in full prior to guest arrival. Reservations cancelled after booking is made and up to 60 days prior to arrival are FULLY REFUNDABLE less booking and processing fees. Reservations cancelled within 60 days prior to arrival date will FORFEIT FULL LODGING PAYMENT. **NO REFUNDS WILL BE GIVEN FOR WEATHER/SNOW CONDITIONS, OR DUE TO CANCELLATION, INTERRUPTION, OR CHANGES BY AIRLINE, AUTOMOBILE, OR OTHER TRANSPORTATION SERVICES. NO EXCEPTIONS. The Alpenhof Condominiums, a 10-unit complex, is family owned and operated. We are all avid skiers and have been involved in the Park City scene since the resort first opened in 1963. Back then, we started with a small miner's shack! We take great pride in keeping the Alpenhof very clean and well maintained, and look forward to providing each guest with a quality experience. We very much enjoy making our guests comfortable and hope you will feel at home when you stay with us. Please let us know if you have any special requests or needs, and we will do our best to accommodate you! It is a 5 minute walk to ski rental (park city sports), lift ticket purchase, and,of course, the ski lifts (Crescent and Payday). We did not rent a car and it is an easy walk to The Fresh Market for groceries and shopping/restaurants on Main Street. The condo has plenty of hot water and a good heating system which was good since we happened to be there during a frigid spell. My family of five was comfortable the week we were there and would consider staying there again unless we found something less expensive. Although we did not meet personally, Nancy and her family took great care of the condo. We had great communication and they followed all house rules. They left the condo so clean, it was almost as if no one had stayed there! We really appreciate that. We would definitely host Nancy again and would highly recommend them to any other host. No question you get your money's worth! Made the whole trip simple for us - the management and owners are great to work with - there was a gift basket waiting when we arrived! I would definitely stay here again. We had a nice stay a Alpenhof. It was a short walk to the and the walk home after a long day of skiing was down hill which was great. Unit was well stocked with all amenities. Barb was very helpful in all aspects. I would recommend this unit to anyone. We had a great stay at the Alpenhof Condo in Park City and would highly recommend it to anyone. Barb and Art were extremely responsive and hospital and very friendly too! Great location and great accommodations. 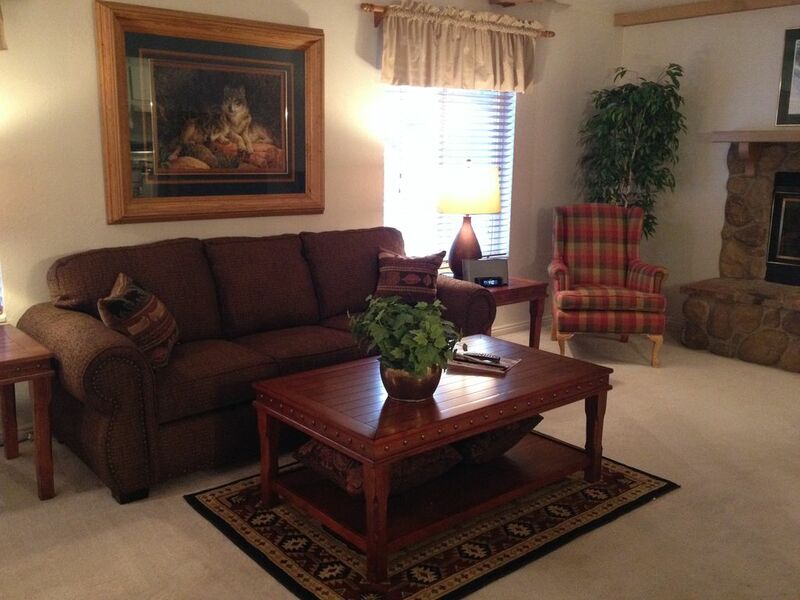 Clean and well maintained and well stocked with everything you need for a great stay in Park City. We came to the Alpenhof Condominiums for our thanksgiving holiday. The condo was very cozy and very clean. The living room was very nice and the decor was lovely. The kitchen was a bit out of date but still met our needs. The beds were comfortable and the showers were nice and had good water pressure. The condo did have every comfort of home and everything you would use at your own house. That came in handy for cooking! It is also conveniently located to the resort center for Park City Mountain Resort, close to the grocery store and we were easily able to walk a mile to Main Street. There was also a bus stop less than a block away which was nice. I would highly recommend this property and would stay here again. Update: The kitchen was upgraded with new stainless steel appliances in Feb 2016. **Rates subject to change until booking is confirmed with payment. **We accept VISA, MASTERCARD, and AMERICAN EXPRESS only from US resident cardholders. Foreign guests must pay by bank-to-bank transfer for all reservations made from outside the USA. **NO PETS OF ANY KIND. NO SMOKING PERMITTED ANYWHERE ON THE PREMISES. ***OFF-STREET PRIVATE PARKING FOR ONE (1) VEHICLE ONLY. PERMIT REQUIRED. *** **MAXIMUM OCCUPANCY 6 PERSONS.